Muzzles may look scary if you are not used to them but a correctly fitting muzzle is not harmful to your dog and if introduced properly dogs can learn to be completely relaxed whilst wearing one. Contrary to some of the myths & stigmas attached to them, muzzles are often the sign of someone being a responsible dog owner and minimising the risk to their own dog and others. A muzzle can provide the peace of mind to get out to exercise a reactive dog and to allow an opportunity to do further training, where appropriate. Within the context of canicross muzzles are used to prevent nips/bites which can occur through excitement, fear or prey drive. Muzzles are however not a license to let dogs with aggressive behaviour cause distress to other animals or people (distress & even injury can still be caused whilst wearing a muzzle), nor should they be used to repeatedly force your dog into situations they are not comfortable with (the stress of this can cause further reactivity)..
What type of muzzle is appropriate? A plastic or metal basket style muzzle should be used – these allow air to circulate & dogs to pant adequately, as well as drink water, both of which are absolutely essential during canicross. 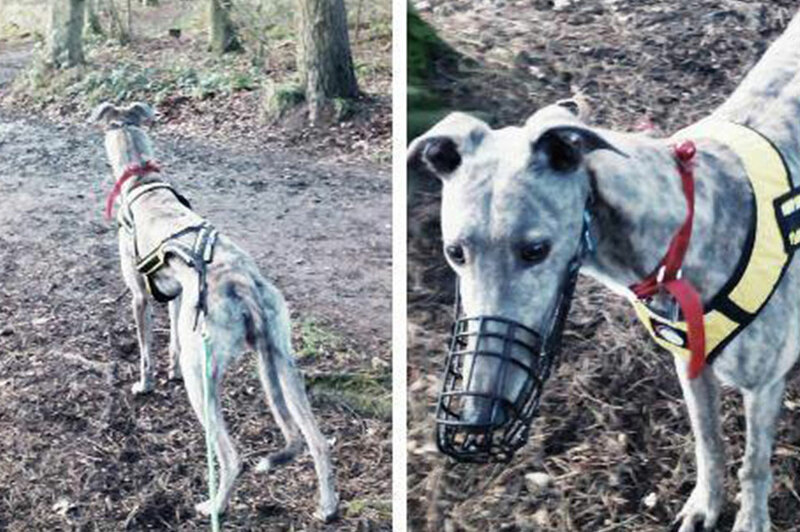 Mesh muzzles are not appropriate as dogs cannot breathe properly when exercising in them. Where can I get a muzzle? Different styles of muzzle are suited to different face shapes & it’s very hard to judge what size a dog will need without trying on, so it is best, where possible, to try a variety of different styles & sizes on before purchasing. Just Dogs Shop in Stockbridge sells several different styles of plastic basket style muzzles & has experienced staff who can help you select the right one for your particular dog. How do I teach my dog to accept wearing a muzzle? It is very important to desensitise your dog to wearing a muzzle so that they do not feel frightened or uncomfortable. Create a positive association with the muzzle by pairing it with yummy treats, fun games or something your dog really likes. Gradually build up the length of time your dog is wearing the muzzle for, starting with only a few seconds at first so that your dog gets used to the sensation of having it on. This video demonstrates how you can teach your dog to accept (& enjoy!) wearing a muzzle. CSE dog Sandy wears a muzzle whilst running because his upbringing within the greyhound racing industry means he may try to chase small, fluffy, fast moving dogs. There is more information about muzzles here. Nervous Maggie conquers her fear and loves Canicross!! Comments Off on Nervous Maggie conquers her fear and loves Canicross!! CSE and the Queen’s Baton Relay!! Comments Off on CSE and the Queen’s Baton Relay! !